I am fairly confident, make that positive that our son Paul does not read my blog. So I am posting a photo of the quilt he is getting for his birthday. We are going to his place for a dinner out and we can give it to him after dinner. This pattern is called Log Cabin Rendition and was a test quilt I did for The Quilt Pattern Magazine. The pattern appeared in their July 2014 edition. Scrap Quilt series from this year. There have been some terrific posts. So plan to join the fun in 2015. Crazy Busy, how does it happen? I completed these test blocks earlier this week. They are for Juliet at The Tartan Kiwi (here). The pattern is now available in her Craftsy shop and the link is available on her home page. The blocks are 7" x 14" finished. 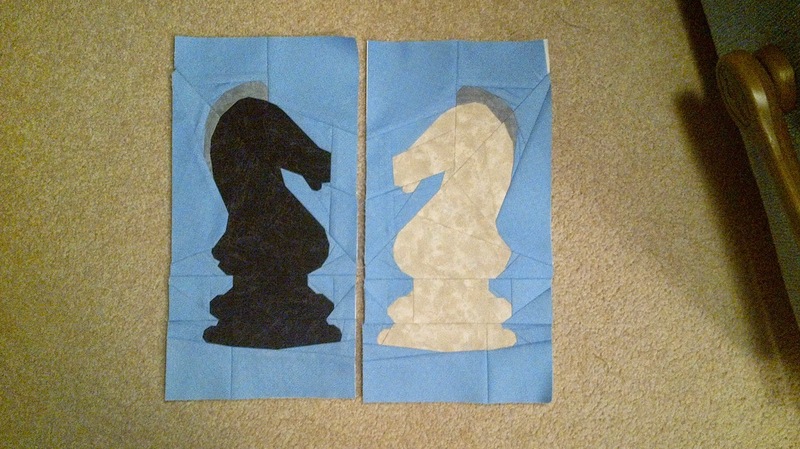 If you have a chess player in the family these would make a portion of a lovely gift. I asked if she would be doing any more of the players and she indicated it would depend on whether there was any demand. 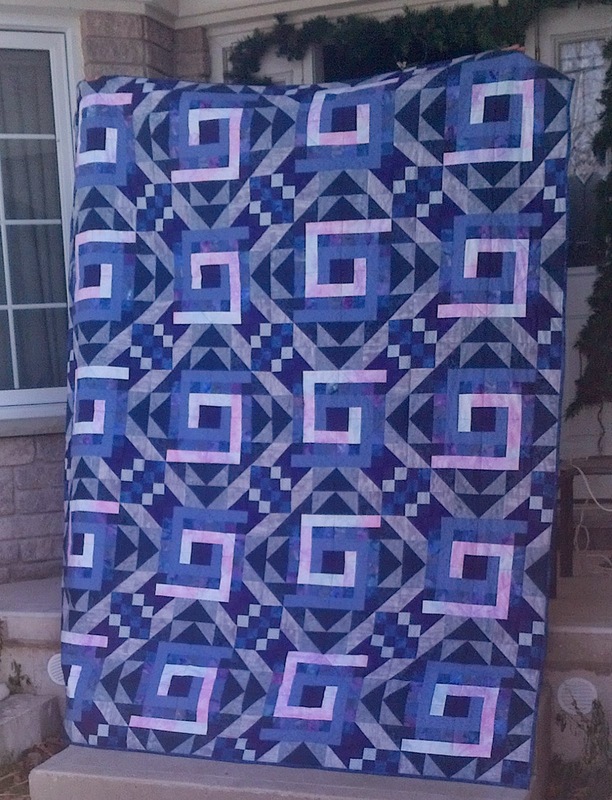 I finished the test for a mystery quilt that will be featured over four issues in The Quilt Pattern Magazine. That one I cannot show you but I will say that DH thought it was spectacular. I used a colourway that I don't normally use and find it is a challenge to get outside my comfort zone but I too was happy with the result. After more than 10 years of regular use DS's bed quilt wore out. He asked his Dad if there was any chance his Mom (me) would be making him a new quilt for his birthday. So you now know what is up next on my list. 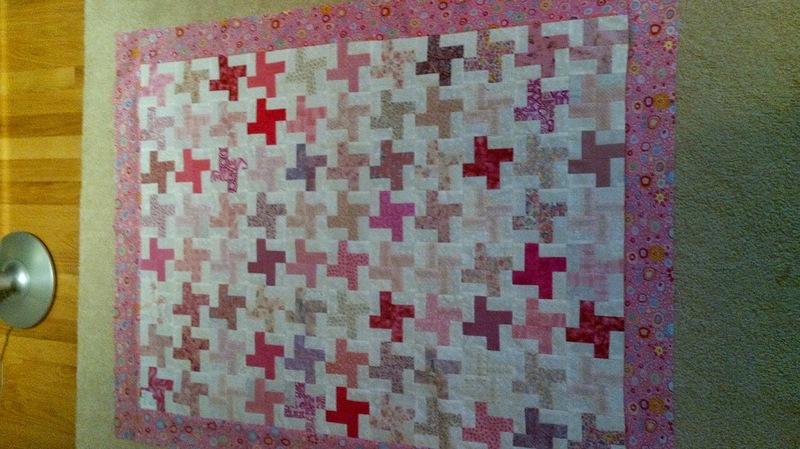 It is queen size and I am working on pinning it for quilting. Scrapbag quilters have finished for this calendar year. I am on for the January project. I have picked the pattern just need to fine tune my instructions and make the kits. That doesn't have to be done until the end of January so it is definitely on the back burner.